Two New Records Set By The Global 6000! Bombardier Business Aircraft announced today that a Global 6000 aircraft owned and operated by NetJets, a Berkshire Hathaway company and worldwide leader in private aviation, set a new standard for speed between three of the world’s most challenging airports. Flying from Aspen, Colorado to London, England and then on to Lugano, Switzerland, the ultra-long-range Global 6000 aircraft set two new city-pair speed records*. After departing from Aspen Pitkin County Airport in Colorado in challenging terrain, the aircraft arrived at London City Airport in a record eight hours on October 20, 2015*. The aircraft’s engines, optimized for takeoff from high-altitude airfields, pushed it to cruising altitude in just 20 minutes, flying 4,168 NM (7,719 km) at an impressive maximum cruise speed of M 0.89, among the fastest of any business aircraft**. The Global 6000 aircraft is a cut above all other business jets in its class with the capability to conveniently fly in and out of difficult to access airports, such as Aspen and London City. Indeed, London City’s central location means that a very steep approach angle due to stringent noise abatement requirements, combined with a short runway, allows access to only the most technologically advanced aircraft such as the Global 6000 and Global 5000 aircraft. The NetJets crew set a second speed record on October 21, 2015, as the aircraft flew a round trip between London City Airport and Lugano Airport in the Swiss Alps*. The 962-NM (1,782-km) journey was completed in 2 hours and 43 minutes of flying time at a maximum cruise speed of M 0.89*. Lugano Airport also features an extremely steep approach with an angle of descent that is more than double the industry standard and a short runway of only 4,700 feet (1,432 meters). 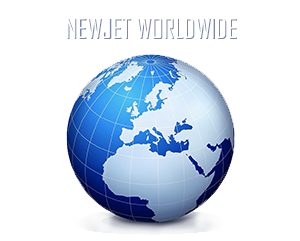 On March 1, 2011, NetJets placed a firm order for 50 Global business jets with options for an additional 70 Global aircraft. The Global 6000 business jet offers more cabin volume and more floor space than any other aircraft in its class. No other business jet in the ultra-long-range segment today matches the high-speed range capability and mission flexibility delivered by this aircraft. Offering the ultimate in cabin comfort, this impressive jet can link Moscow with Los Angeles non-stop with eight passengers and four crew**. It can travel 6,000 NM (11,112 km) at M 0.85 with up to eight passengers**.